During hair transplant consultation, many of my patients bring old photographs from their prime years. Most often this is done with the good intention of giving me an 'idea' of the hair loss. Hidden inside that good intention is the expectation that their new hairline will look exactly like it used to be. As a plastic surgeon, this puts me in a tight spot. 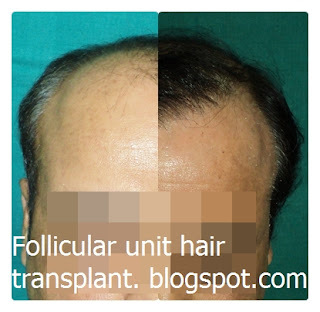 While old photos are valuable to me for assessment regarding design and pattern of hair loss, the extent of restoration depends solely upon the availability of hair in donor area and patient’s commitment for multiple sessions. My primary goal during reconstruction of a new hairline is natural appearance. A mature natural hairline looks far better than a low unnatural hairline any day. In fact low hairline is a hallmark of an inexperienced surgeon, who often becomes a ‘yes man’ and harms the patient in long run. So, what makes an ideal hairline? You can find it yourself. Discreetly, try to observe the hairlines of people around you. You will find that no two hairlines are same. This is because Mother Nature, the greatest artist of them all, never repeats her design. But, once you have seen many; you will also appreciate a pattern that keeps on repeating itself. While designing a hairline, one has to balance this fine art of creating a unique hairline while respecting the pattern. The uniqueness or artistry cannot be defined, but the pattern is here for you to understand. 1. Location: The hairline basically separates forehead from scalp. Notice that forehead is surrounded on the top and sides by scalp hair and below by the eyebrows. Recession of any scalp hair will give appearance of baldness. So, under ideal circumstances, both top and sides should be restored. The height of forehead should be at least as much as the nose. Most transplant surgeons keep it in the range of 8 to 11 cm, but exceptionally it may be placed lower also. Note the unnatural location, shape, border and density of hairline. This patient underwent hair transplant at a clinic in Gurgaon, a New Delhi suburb . 2. Shape: Hairline is slightly convex or wave shaped in adult males, while it is straight or downsloping in children and women. The former is called mature hairline and the latter, juvenile hairline. A straight hairline uses much more donor resources than a mature hairline. It is requested very frequently especially by young hair loss sufferers planning a hair transplant. However a wise hair transplant surgeon designs it rarely, for maintaining it in long term may need many more sessions in future. 3. Softness: One of the most overlooked characteristic of natural hairline during hair transplant is its wispy, feathery appearance at the border with forehead. A good surgeon will try to replicate this using single, fine hair in the front of hairline. Also notice that hairline is not linear. It is undulating and broken in places around an imaginary line. This also gives softness to hairline. A very natural looking hair transplant. Note the soft, undulating, convex hairline. 4. Direction: The direction of hairs in the hairline is predominantly downward and forward. The exception to this rule is cowlick, where the hairs go upwards or to a side. The misdirected hairs in a transplant stand out against the grain of natural hair, especially in a short cut. A hairline is often termed the signature of a hair restoration surgeon. It is the most visible feature of a hair transplant and little mistakes in hairline can ruin the effect of an otherwise well executed surgery. While choosing your surgeon, look at his creations and assess them for natural appearance. A striking unnatural change often becomes a point of conversation and has the potential of embarrassing you. Try to avoid it. For further info on aesthetics of hair transplant contact Provelus hair Transplant Clinic, Delhi. For those of you who do not know, who Sanjay Dutt is, I can tell that he is a big star in Hindi film industry, has done memorable roles in many movies and has led an eventful life so far. For those of you who do not know, who Kanch Cheena is, I can tell that I also did not know about it till a short time ago. Now, I know that Kancha Cheena is the name of principal negative character of a Hindi movie called Agneepath. 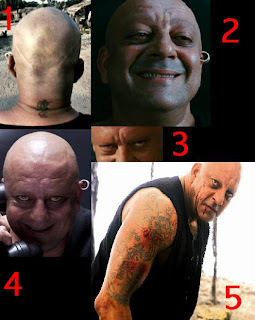 To play the character of Kancha Cheena, Sanjay Dutt went bald. The next logical Q would be, why am I, a cosmetic and hair transplant surgeon, blogging about this? See that nice 'U' shaped scar on the back of his scalp. That's exactly how a hair transplant scar looks like, when strip method is employed. Since this scar had piqued my curiosity, I did a little more googling and came up with this. Truth About Cheap Hair Transplants. Recently, there has been a flood of hair transplant clinics who are willing to do transplants at ridiculously low prices. As a consumer, you think this is because of growing competition in the field. And like other commodities prices had to fall one day. You are happy that now the procedure is within your 'budget' and you quickly get a transplant before you lose this golden opportunity. Few months pass by and you see some hair growing. You are overjoyed by this new growth and give yourself a pat on the back for a wise decision. Few more months pass by, and you don't really see the results you expected. You talk to your hair transplant physician ( who you now realise is just a general surgeon or not even that) and he reassures you of great results in few months time. A question frequently asked by my patients is about hair weaving and bonding. Some of them think it is a variety or technique of hair transplant. In fact, it is not. 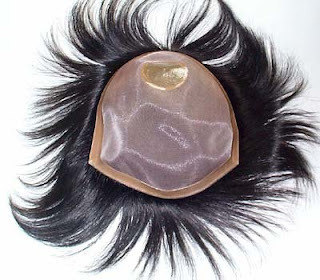 These are just ways to attach artificial non growing hairs or wig to your scalp. This confusion has occurred because clever new age salesmen wanted to overcome the negative connotations that the words "wig" "hairpiece" and "toupee" conjure up in the minds of most men. Instead of calling their products wigs, we now have "hair extensions", "hair weaves" or some kind of fancy "non surgical hair restoration systems". Listed below is a list of all the different types of wigs with an explanation of each. Dr. Sharad Mishra is an expert Plastic, cosmetic and Hair restoration surgeon based in New Delhi, India. He graduated as MBBS from India's top rated Armed Forces Medical College, Pune; followed by prestigious Masters of Surgery degree from KGMC, Lucknow. He then went on to receive highest surgical degree available in India "M.Ch" in 'Plastic & Cosmetic Surgery' from world renowned Post Graduate Institute for Medical Education and Research, Chandigarh. Dr. Mishra holds many years of surgical experience and has taught plastic surgery as 'Assistant Professor in Plastic Surgery' at Dr. RML Hospital and PGIMER of Delhi university. He has performed hundreds of successful cosmetic and hair transplant surgeries, and has also developed a new technique for follicular hair transplant.His research in field of plastic surgery has been published in national and international plastic and cosmetic surgery journals. His contribution in field of hair transplant surgery has been widely acclaimed. He currently practices at Apollo Hospital & Provelus Hair Transplant Clinic, Delhi.